EVANS understands the critical role of project management in every mission-critical environment – that’s why every EVANS project receives an experienced and dedicated project manager. 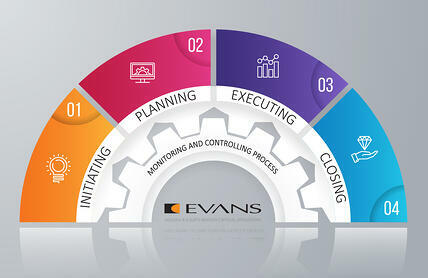 EVANS offers the unique value of being one of the most experienced companies in the industry, in part due to our highly detailed, standardized project implementation process. We bring industry best practices from over 12,000 projects to help you achieve your project objectives. Your dedicated project manager and support team will guide and manage your project through its life-cycle to ensure we meet your project’s success from inception to completion. Project initiation and planning phases are crucial to our success. A typical project plan follows a straightforward approach to ensure consistency and quality in all implementations, no matter the size or scope of the project. Throughout each phase the EVANS PM will monitor the progress of the project, ensuring it stays to the defined scope and schedule…keeping the build on time and on budget.